If this picture is any indication of the future of our government, it's looks like Chewbacca and a Stormtrooper will be joining the White House staff. Though their official roles have yet to be announced, we imagine they've been hired as ambassadors in Obama's quest to establish intergalactic relations. When asked about a potential role in the administration, Chewbacca replied enthusiastically, "ARHHHHH!" The FLOTUS is clearly unimpressed with this change in staff, and we have to say that we, too, are a little skeptical. When we saw the Presdient's tweet with this picture a few hours ago, we started to give it more thought. 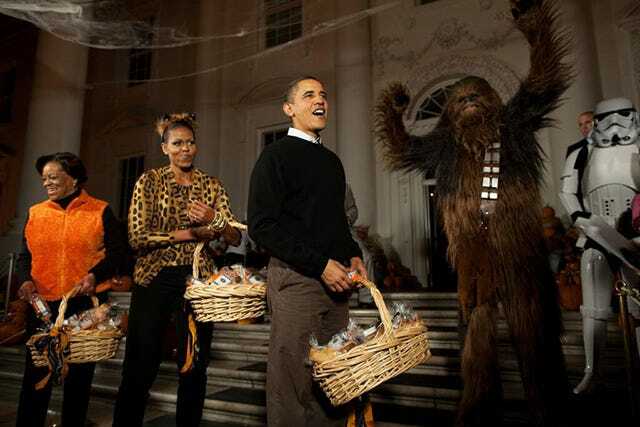 If Obama is joining forces with Chewbacca, does this signify his participation in the Rebel Alliance? Even though Obama is technically part of the Empire, we like to think he's a bit of a rebel. The White House declined to comment on whether Air Force One will be replaced with the Millennium Falcon, or become an additional part of the President's transportation arsenal.